1. Department of Radiation Oncology, University of Pittsburgh Cancer Institute, Pittsburgh, PA, USA. 3. Department of Radiation Oncology, MD Oswal Memorial Cancer treatment and Research Center, Ludhiana (Pb), India. Radiation quality indices (QI), tumor control probability (TCP), and normal tissue complication probability(NTCP) were evaluated for ideal single and double plane HDR interstitial implants. In the analysis, geometrically–optimized at volume (GOV) treatment plans were generated for different values of inter–source–spacing (ISS) within the catheter, inter–catheter–spacing (ICS), and inter–plane–spacing (IPS) for single - and double - plane implants. The dose volume histograms (DVH) were generated for each plan, and the coverage volumes of 100%, 150%, and 200% were obtained to calculate QIs, TCP, and NTCP. Formulae for biologically effective equivalent uniform dose (BEEUD), for tumor and normal tissues, were derived to calculate TCP and NTCP. Optimal values of QIs, except external volume index (EI), and TCP were obtained at ISS = 1.0 cm, and ICS = 1.0 cm, for single–plane implants, and ISS = 1.0 cm, ICS = 1.0 cm, and IPS = 0.75 to 1.25 cm, for double – plane implants. From this study, it is assessed that ISS = 1.0 cm, ICS = 1.0 cm, for single - plane implant and IPS between 0.75 cm to 1.25 cm provide better dose conformity and uniformity. Keywords: HDR interstitial implants, quality indices, inter-source-spacing, inter-catheter-spacing, geometrical – optimization at volume, biologically effective equivalent uniform dose. Use of computerized, remote controlled, high-dose-rate (HDR) brachytherapy units, and treatment planning systems provide conformal dose coverage to the target volume and minimum possible dose to surrounding normal tissues / critical organs. 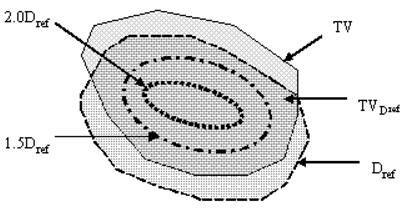 However, the basic principles of dosimetry systems [1 - 4] still influence the criteria of the source placement (activity distribution) and dose distributions in brachytherapy applications. In the HDR brachytherapy applications, such as in the treatment of carcinoma of the cervix (Ca.Cx. ), the basic rules of the Manchester system  are still followed in many clinics World wide. In the HDR interstitial brachytherapy (ISBT) implants none of the classical dosimetry system [1 - 4] is followed. This is because modern HDR units have a high activity miniature type single stepping source, which offers an advantage of varying source positions (dwell positions) and time (dwell time) to a particular dwell position to obtain an appropriate dose distribution and isodose geometry. For HDR implants, a new dosimetry system, known as stepping source dosimetry system (SSDS) , has been devised in which source and dose distribution rules were formed using the selected basic rules of the Paris and the Manchester dosimetry systems with some modifications. Kwan et al  have done a computerized dosimetric study to determine optimal source and ribbon separation for single – plane implants, and the ribbon and plane separation of for double plane implants were studied with respect to the dose homogeneity, for single – and double – plane iridium – 192 (Ir – 192) implants. In another study of Quimby type breast implants, interplanar spacing, based on the implant sizes, was studied . None of the study has so far able to optimize these parameter for HDR single – and double – plane implants. In this work, we performed a computerized dosimetric study of HDR implants to find out optimal values of inter – source – spacing (ISS), within the catheter, and inter – catheter – spacing (ICS), within the target volume (TV), for ideal single plane implants. This was done by computing various radiation quality indices (QI) for geometrically optimized at volume (GOV) treatment plans. The GOV mode of optimization was chosen due to its simplicity, otherwise reader can choose any other suitable mode of optimization in practice. The inter – plane – spacing (IPS) for ideal double plane implants has also been determined using optimal values of ISS and ICS, obtained from single plane implants, by computing above said QIs for GOV treatment plans. The concept of Biologically Effective Equivalent Uniform Dose (BEEUD) has been introduced to calculate the tumor control probability (TCP) [8, 9] and normal tissue complications probability (NTCP)  for these HDR plans. 1. Coverage Index (CI): The fraction of the target volume that receives a dose equal to or greater than the reference dose . 2. External Volume Index (EI): The ratio of the volume of normal tissue that receives a dose equal to or greater than the reference dose to the volume of the target . 3. Relative Dose Homogeneity Index (DHI): This is defined as the ratio of the target volume which receives a dose in the range of 1.0 to 1.5 times of the reference dose to the volume of the target that receives a dose equal to or greater than the reference dose . 4. Overdose Volume Index (ODI): This is the ratio of the target volume which receives a dose equal to or more than 2.0 times of the reference dose to the volume of the target that receives a dose equal to or greater than the reference dose . 5. Dose Non-uniformity Ratio (DNR): This is the ratio of the target volume which receives a dose equal to or greater than 1.5 times of the reference dose to the volume of the target which receives a dose equal to or greater than the reference dose . To compute above defined QIs, for single plane implants, ideal targets of target volumes of the dimensions of Length (L= 6.0 cm) × Width (W= 5.0 cm ) × Thickness (T = 1.0 cm) have been taken into account. While changing the values of ISS and / or ICS, sometimes extra length and width of target volume were also added to keep constant distance between target surface and peripheral dwell positions and / or target surface and peripheral catheters. The catheters and peripheral dwell positions were placed within 0.5 cm of the boundary of the target volume. Treatment plans were generated using PLATO (Nucletron BV, Veenendaal, The Netherlands) 3 – D treatment planning system. The dose points were placed on the surface of the target volume relative to the active dwell positions. All the dose points, in the implant, were used for dose normalization for the total dose of 42 Gy with 3.5 Gy per fraction. 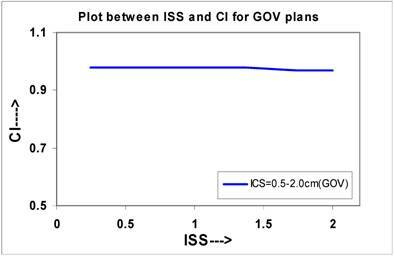 The Cumulative DVH (cDVH) for GOV treatment plans were generated for different values of ISS and ICS. The values of ICS vary from 0.5 cm to 2.0 cm, in steps of 0.25 cm. For each ICS values, the ISS varies from 0.25 cm to 2.0 cm in steps of 0.25 cm. In each treatment plan, the isodose surfaces of 100% (42 Gy), 150% (63 Gy) and 200% (84 Gy) were generated to find out the respective dose coverage volumes. By comparing the QIs for all treatment plans, the optimal values of ISS and ICS were obtained for which QIs to be the closest values of that of an ideal implant. The GOV treatment plans were also generated for double plane implants using optimal values of ISS and ICS, obtained from single plane implants QI analysis. The cDVHs were generated for inter – plane –spacing (IPS) vary from 0.5 cm to 2.0 cm in steps of 0.25 cm and the coverage volumes for the isodose surfaces of 100%, 150% and 200% were obtained from the cDVHs, as calculated for single plan implants, to compute the above said QIs for each treatment plan with different IPS value. Where α/ß ratio is the tissue specific parameter and is the ratio of the coefficients of lethal damage to the sublethal damage, and G is the factor accounting for incomplete repair of sublethal damage during interfraction interval between the fractions. In this study, it is assumed that the time interval between the fractions is sufficient enough to allow the full repair of the sublethal damage, hence G is taken as 1. Probably three radiobiological parameters, considered in the TCP formulation, such as clonogenic cell density (ρ), radio-sensitivity (α), and cell proliferation rate (Tp) influence the TCP phenomenological and are voxel dependent. In this work, it is assumed that first two parameters are constant throughout the target volume and influence of the cell proliferation rate is negligible. For statistical comparison, two tail unpaired t-student test is employed to the results of NO and GOV plans. The curves were plotted for single plane implants between ISS and IQs, which are shown in Figures 2 to Figure 6. Figure 2 shows that the CI decreases from 0.98 to 0.97 for the values of ISS, which may be considered almost constant. The slope of the linear lines is -0.006 for all ICS values. The CI at ISS = 1.0 cm and ICS = 1.0 cm are 0.98 these plans. Figure 3 shows that the value of EI increases in a linear trend insignificantly for all ICS values, and for any value of ISS. In these plans, the slopes of all linear lines remain almost constant with an average of 0.0012 (0.0012, 0.0013). It is clear from Figure 4 that initially the value of DHI increases with increasing ISS and ICS and reaches to a maximum value at ISS = 1.0 cm and ICS = 1.0 cm, and then decreases with ISS. The values of DHI at ISS = 1.0 cm and ICS = 1.0 cm are 0.851 for these plans. The relation between ODI and ISS for different ICS values is given in Figure 5. It appears that the value of ODI decreases with increasing ISS and ICS and reaches to a minimum at ISS = 1.0 cm & ICS = 1.0 cm, thereafter it starts increasing with ISS and ICS. The values of ODI at ISS = 1.0 cm and ICS = 1.0 cm are 0.079 for these plans. 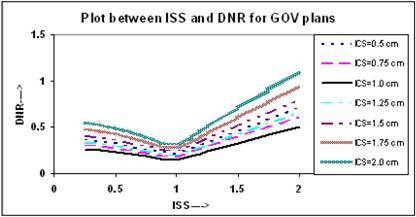 Figure 6 shows similar relation between DNR and ISS as between ODI and ISS. The calculated QIs for an ideal HDR implant reveals that at ISS = 1.0 cm and ICS = 1.0 cm, the values of DHI, ODI and DNR attain an optimal level. In this study, the values of QIs for single - plane implant at ISS =1.0 cm and ICS = 1.0 cm are CI = 0.98; EI = 0.062; DHI = 0.851; ODI = 0.079, and DNR = 0.149, respectively. Schematic diagram showing target volume (TV), portion of target volume (TVDref) that receives dose equal to or more than the reference dose Dref, the isodose surface that receives 1.5 time of the reference dose (1.5 Dref), and that receives 2.0 times of the reference dose (2.0 Dref). A quantitative comparison of CI calculated for varying ISS and ICS values for NO and GOV plans for ideal HDR single plane interstitial implants. 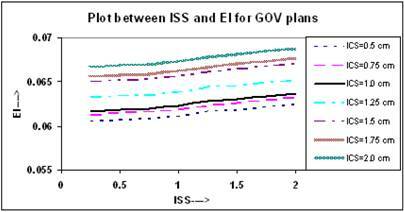 Comparison of calculated EI for varying ISS and ICS for GOV plans, of ideal HDR single plane interstitial implants. 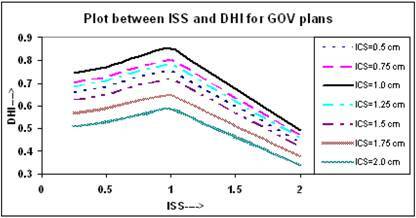 Comparison of calculated DHI for varying ISS and ICS for GOV plans, of ideal HDR single plane interstitial implants. 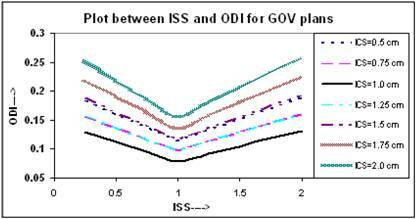 Comparison of calculated ODI for varying ISS and ICS for GOV plans, of ideal HDR single plane interstitial implants. Comparison of calculated DNR for varying ISS and ICS for GOV plans, of ideal HDR single plane interstitial implants. For simplicity of the study, the best suitable values of ISS and ICS (ISS = 1.0 cm & ICS = 1.0 cm) for which DHI, ODI and DNR attain optimal values in single - plane implants, were used to construct the double plane implant. These values of ISS and ICS may not be optimal for double plane implants. The implant length and width were kept constant while the interplane separation (IPS) allowed to vary from 0.5 cm to 2.0 cm in steps of 0.25 cm. The GOV plans were generated for each IPS and to find out the volume coverage for 100%, 150% and 200% isodose surfaces the DVHs were generated. From above determined volumes, the QIs were computed and found that the variation of QIs with IPS is similar to that as of IQs with ISS. For IPS = 0.75 cm to 1.25 cm the QIs are optimal to treat a target of thickness from 1.75 to 2.25 cm. The values of QIs for IPS = 1.0 cm are CI = 0.978, EI = 0.08, DHI = 0.88, ODI = 0.09 and DNR = 0.29. If the IPS is further increased beyond 1.25 cm the DHI decreases and ODI increases, and a cold spot is generated between the two planes. 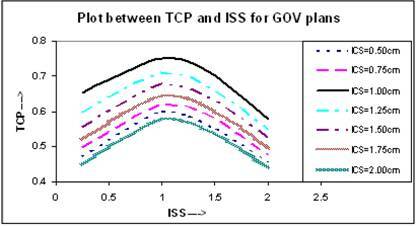 Plots between QIs and IPS, for both type of plans, were similar to that for single plan implants, hence to avoid repetition of the figures, we have not included in this paper. BEEUDs have been calculated using equation (8) for different portions of the TV with the use of α/β = 10 Gy, α = 0.35 Gy-1 , and clonogenic cell density ρ = 107  to calculate the net value of TCP using equation (10) for entire TV. In the calculation of BEEUD, for a particular region of the TV, the volume of that region is subdivided into very small sub-volumes and it is assumed that there is a uniform dose distribution within each sub-volume. The plots between net TCPs and ISS are shown in Figure 7, where the TCP for ICS = 1.0 cm and ISS = 1.0 cm implant is higher compared to other ICS and ISS settings. Comparison of calculated TCP, based on LQ equation, for varying ISS and ICS for GOV plans, of ideal HDR single plane interstitial implants. To calculate the NTCP for normal tissue, the normal tissue / organ is divided into two regions, (i) the region that receives a dose less than the reference dose, and (ii) the region that receives a dose equal to or greater than the reference dose. For demonstration purpose and to simulate the lung complications in breast HDR implants, the BEEUDs values were calculated for each region of the normal tissue / organ using derived values of the parameters , N0 = 3.93, k =1.03, for combined set of lung tolerance data, and α = 0.075 Gy-1, for lung tolerance data of Emami et al  and published values of α/β = 6.9 Gy [19, 20]. The plots of NTCP and ISS for different ICS setting are shown in Figure 8, where it is seen that the value of NTCP increases with increasing ICS and ISS and highest value was found at ICS = 2.0 cm and ISS = 2.0 cm. Similar results were obtained for double plan implants, but to avoid repetition, the figures have not been included. Comparison of calculated NTCP, based on LQ equation, for varying ISS and ICS GOV plans, of ideal HDR single plane interstitial implants. A number of quality indices have been proposed to evaluate LDR and HDR interstitial implants, such as, DHI and DNR proposed by Saw and Suntharalingam [21, 22] and Saw et al  for LDR interstitial brachytherapy and was adopted by Meertens et al  for the evaluation of HDR interstitial implants. Hence, in this study we used the QI values as defined by Meertens et al . The expressions for TCP and NTCP incorporating above defined QIs were derived in this work, and the effects of the variation in ISS and ICS were investigated in GOV plans of ideal HDR interstitial implants. 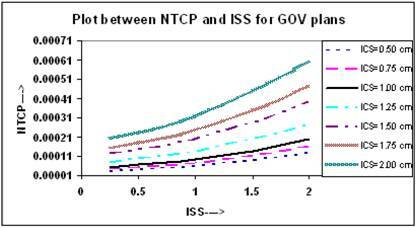 Figures – 7 and 8 show the effect of variation in ISS and ICS on TCP and NTCP. The calculations of TCP and NTCP, done by most of the investigators [8, 9, 10, 14, 15, 16], based on either entire target or normal tissue volume with a single dose or by dividing the entire volume in small voxels. In this work, we have opted different approach, where TV and NTV are divided into 4 and 2 parts to define target and normal tissue related QIs, respectively. The expressions of BEEUD were derived for these parts of TV and NTV, and were incorporated into the expression of the TCP and NTCP. In the Paris dosimetry system, designed for Ir – 192 wires and ribbons, suggests that to obtain a better coverage of the TV, one have to increase the active length of the catheters, and peripheral catheters have to be placed outside the target volume. But by doing so, this also increases the EI which consequently will increase the NTCP. Many researchers investigated this aspect and stated that active length of the catheters can be reduced compared to non optimized plans with uniform dwell times [5, 23, 24, 25] by properly optimizing the implant, because in optimization the dwell times of the dwell positions at the ends of the catheters and peripheral catheters are increased to compensate for the lack of source locations beyond the outermost dwell positions. Kwan et al  have reported that with respect to the dose homogeneity, within the implants, the optimal source and ribbon separation for single – plane implants was found to be 1.0 cm, and the ribbon and plane separation of 1.5 cm was found for double plane implants, maintaining a 1.0 cm source separation. Zwicker et al  found that interplanar spacing in Quimby type breast implants was implant size dependent. Major et al  have studied the effect of source step size and catheter separation on DNR for non-optimized and optimized interstitial breast HDR implants. In their study, the lowest value of DNR is reported for 10 mm source step size. The effect of catheter separation is studied at 5 mm source step size. The catheter separation was increased from 10 to 20 mm, for which the value of DNR reported to be increased from 0.15 to 0.22. While in the present study, QIs were evaluated for the above mentioned values of ISS and ICS and lowest DNR is found at ISS = 1.0 cm and ICS = 1.0 cm, where ISS =1.0 cm is same as 10 mm source step size. From the results of the present study, it can be concluded that in HDR ISBT implants the GOV provides an optimum outcome with regard to afore mentioned QIs, TCP, and NTCP, and is best achieved nearly uniform dose distribution within the implanted volume. While HDR ISBT implants done using classical dosimetry systems or non- optimization process lead to unsatisfactory results. It is also seen that on the basis of CI, EI and NTCP plots, no conclusion can be drawn as to what values of ICS and ISS (and IPS) would be used to optimize the single and double plane HDR implants. While DHI, ODI, DNR and TCP clearly reveal that their optimal values are at ICS = 1.0 cm and ISS = 1.0 cm, for single plane implant and ICS = 1.0 cm, ISS = 1.0 cm, and IPS = 0.75 to 1.25 cm, for double plane implants as shown in the study. Where i = 1, 2, 3, ………n. In the calculation of TCP, for non-uniform dose distribution within the tumor, the use of BEEUD is an appropriate term instead of BED. In the calculation of NTCP, the use of BEEUD, for normal tissue / organ with highly non-uniform dose distribution, would provide better radiobiological in sites.